It’s Moderate Mania As Rep. Ryan Jumps in Race, Biden Soon To Follow. 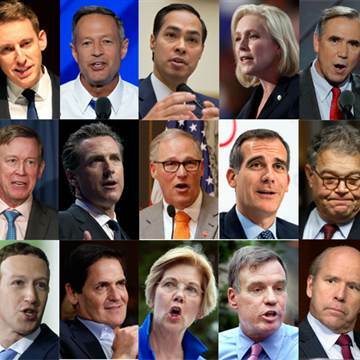 Meet The 16 (And Counting) 2020 Dem Candidates! Ryan has long been seen as a player in the “moderate” lane of the 2020 primary and some speculated that he was waiting to see if Joe Biden would actually get in the race. Instead, Ryan announced the day after Joe Biden made it all but official. In his “non-apology apology” video released on Wednesday, Biden begins by saying “Folks, in the coming months I’ll be talking to you about a whole lot of issues.” It’s hard to imagine what other issues the former vice president would have to chat about than a 2020 POTUS bid. *indicates a candidate who has formally declared his/her candidacy or created an exploratory committee. Did we miss someone? Please send the name to Michael@insidesources.com. Thanks!